"People have wanted to leave their mark since the beginning of humanity," says Veysel Berk, creator of the mobile app Wallit. "Now they are going to be able to do that digitally using their smartphones." Released Tuesday for iPhone and iTouch, Wallit is hailed by Berk as the world's first "social augmented reality app." Like Facebook, it enables you to interact with your friends. Like Twitter, it only lets you write in short 140-character bursts. Like Foursquare, its digital benefits are based on where you go in the real world. But Wallit combines these features — and more — in an entirely new way. You go somewhere, for example a stadium or the Golden Gate Bridge. You view the the place through your smartphone camera screen, as if taking a photo. 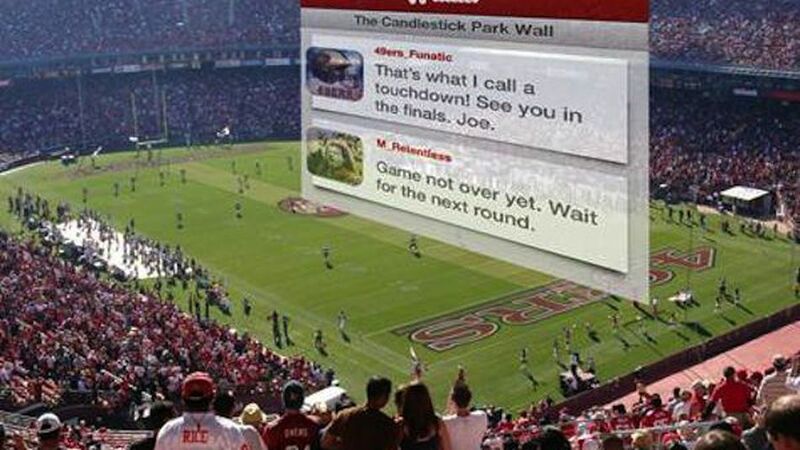 But with Wallit, a digital augmented reality-powered wall appears on the screen next to the landmark to show posts, photos, videos and other "marks" by people there at the same time or before you (see concept shot, above). Then you can add your own mark to the wall for others to see. Wallit "records the character of places," Berk says. Most location-based apps actually focus on people, and locations are parameters, albeit highly significant ones. With Wallit, the place itself is actually the core, and people function as parameters. To ensure a focus on place without neglecting social interaction, the app has some distinctive rules. You can only post to a place if you're actually there. (You can view a wall from anywhere, however.) You can only upload a media to a wall if it was created at that location. You can request walls, but only Wallit can actually create them — that way, each location has one definitive wall. Wallit has already created more than 700 walls around the world, including in London, Tokyo, New York and San Francisco. A "radar" function app points you to virtual walls near you. Post with an anonymous Wallit ID, or link Wallit activity to your Facebook or Twitter profiles. When viewing walls at different locations, screen-swipe between walls showing posts by everyone or just people who have linked to existing social profiles. Soon, as content proliferates, Berk says you'll also be able to see only posts by friends. When the iPad 3 launches in the not-so-distant future, Berk says there will be Wallit walls in 326 Apple stores for people to post to as they wait in line. But their posts will also go to a "Super Wall" that compiles in one place posts from every store. That grouping concept is a key function for Wallit in the future. He also plans to link related sites, for example, different football stadiums. Berk says Wallit has already secured $1.2 milllion in funding by angel investors and venture capitalists. The app will be free (iPad and Android versions are due out soon) and initially focus on building user engagement. But Berk says it won't be hard to monetize Wallit in the future. Virtual, interactive billboards will be one way. Allowing companies to customize their on-site walls will be another. Companies will also be able to buy subscriptions allowing them to access data about what people are saying and doing at their locations. From what we've seen, Wallit is cool and simple to use, with an easy user interface. The only question is whether people will want to add another social layer — even one centered around places — to their already-crowded virtual lives. Do you think Wallit will sink or swim? Let us know in the comments.